Amid high amounts of rumor and speculation concerning recent leaks of information for the upcoming title, Nintendo came out swinging with a 40 minute Direct presentation focusing on Super Smash Bros. Ultimate. This was the final Smash Direct before the release of the highly anticipated game on December 7 and Director Masahiro Sakurai himself had plenty new information to tide fans over until the game’s release. The details of which include plenty of additions to the expansive roster and major developments in gameplay that have not been seen before. Starting off in epic fashion, Sakurai revealed two all new fighters in a cinematic trailer: Ken from the Street Fighter series and Incineroar from Pokemon Sun & Moon. Ken will function as an echo fighter of Ryu for his appearance in Ultimate. However, there are some tweaks and differences that will set him apart from Ryu that make him more than a simple palette swap. His model is based on the move set and functionality he picked up in Super Street Fighter II Turbo. This iteration features a burning shoryuken, new moves such as Hell Wheel and his signature kicks that change based on command inputs. To go along with all of this, he is slightly faster than Ryu, which should give him a slight edge in battle. Ken was not the only new reveal though, with Incineroar joining the battle for the first time in a Smash title. Coming in as the last new fighter reveal before launch, Incineroar brings a pro-wrestling and grapple style to the game, with many powerful throws. His signature moves like ‘darkest lariat’ and his z-move ‘max malicious moonsault’ which will function as his final smash have being ported over into the game. Following the reveal of two fighters, additional amiibo figures were shown off. In the first new wave that will launch alongside Ultimate on December 7, Inkling, Ridley and Wolf will be available for purchase. As previously announced, amiibo figures will become available for every new fighter, including returning stars. King K. Rool and Ice Climbers will be up for sale on February 15 of next year, and 2019 will see extra figurines developed for combatants such as Daisy, Young Link, and even Pichu. Easily the largest portion of the Direct was devoted to revealing the new game mode titled “Spirits.” Spirits will see a multitude of new characters that lose their physical forms but exist in the imagination of the game’s world. The selection is enormous and adds to the crossover Nintendo universe by giving you a chance to have them assist you in battle. In an array of creative custom battles with existing fighters, you can unlock characters from Metal Gear Solid to Fire Emblem. The variety continues as you select primary and support spirits that give additional strengths and weaknesses that you can carry into local battles. Online features were also given a separate segment highlighting matchmaking styles. Preferred rules can be equipped that determine items, stock and time and servers can search for players with similar selections and link you with them. Global Smash Power is an online leaderboard that determines how excellent you are at the game analogous to the number of other players. Finally, prioritized proximity servers allow the connection over longer distances to not go under so much strain, looking to allow a faster connection. 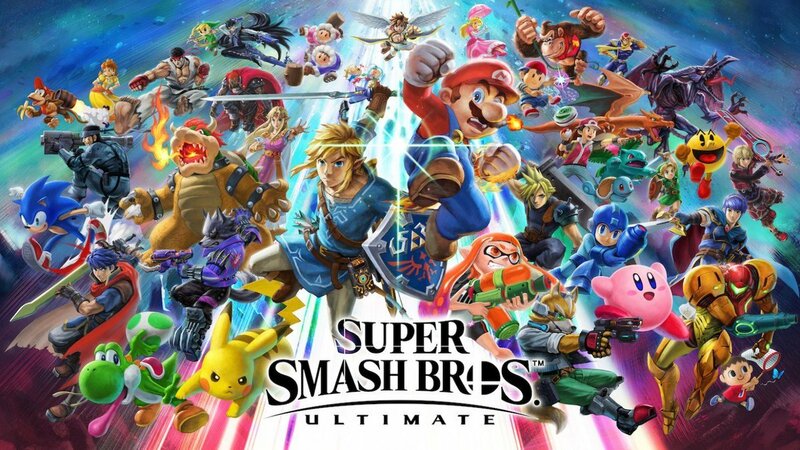 Additional smaller features were revealed as well, including smash tags to collect from players you have defeated, Battle arena mode allowing for spectators and continued voice chat features from the Nintendo Online app. Contrary to previous leaks, both Shadow from the Sonic the Hedgehog series and Isaac from Golden Sun have been revealed as assist trophies. Those were not the only selections shown off however, Spring Man from Arms and Guile from Street Fighter will join the additional 59 assist trophies. Other functionality that was brought up closer to the end of the Direct took a long look at different hardware capabilities featured at launch. With ‘Replay’ you can save data and create videos of your battle to share online. ‘Records’ allows you to take a look at your unique battle history in offline and online. Also included is a ‘Balance’ switch within the fighter select menu to increase or decrease damage advantages for a fair fight when playing against friends who are of more elite status. The game also features 11 fully voiced languages ranging from Japanese to Russian and a whole bunch more mii fighter costumes for Arms ribbon girl, Breath of the Wild’s Yiga Clan and even a Toy-con Labo set. The hint of downloadable content after launch was not left off the table either. DLC was revealed to currently be in development with both individual sets and a fighter pass. Each new set will feature one new fighter, a new stage and a new music track. For the players in it for the long haul, Nintendo is also offering a Super Smash Bros. fighter pass that includes the five individual sets for 25 dollars. Throughout the upcoming year after launch, these pods of extra content are expected to be dispersed. Finishing out the 40-minute presentation was a cinematic trailer mixed with gameplay about the suspected single-player mode. This adventure mode will go beyond ‘Subspace Emissary’ which was the last single-player addition featured in Smash Bros. Brawl. Introducing the board game style from Smash for Wii U, it sees players traveling around the map defeating and gathering other fighter’s lost souls to bring them back onto your team. Along with an impressive song to go along with the already released score, we get the title for this expansive story mode: World of Light. Super Smash Bros. Ultimate is expected to release on December 7 for Nintendo Switch.